You gotta love the Spaniards. 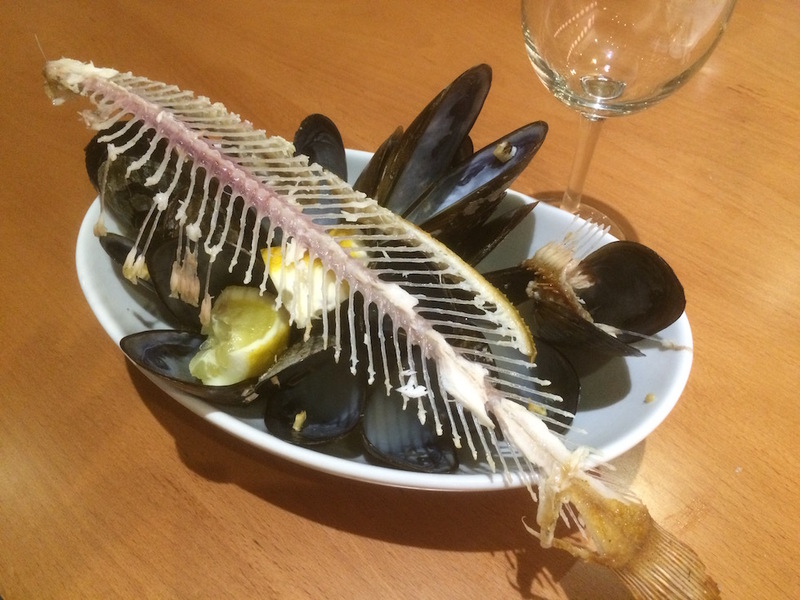 To be able to order a Filet de Lenguado with sautéed vegetables and a generous portion of mussels served in a fragrant broth at 11:30 at night was fantastic. Especially after our late flight to Malaga and having had difficulties in locating our hotel we had hopes of finding a snack but to our delight we enjoyed a fine dining experience. Food is but one of the reasons we are drawn back to España again and again. The Spaniards simply know how to enjoy life and embrace it in their daily rituals. My kind of people. Malaga is a melting pot of cultures. This 2,800 year old city was founded by the seafaring Phoenicians around 770 BC and today has a bustling port with direct access to the sea and trade routes that have contributed to their rich cultural heritage and is reflected in their impressive architectural cityscape. In the early morning Franz and I climbed the hill that houses the iconic Alcazaba and we were greeted by the twittering of birds and slopes of withering cactus that resembled ghostly images of Don Quixote and conquistadors. The fortress sits right in the center of the historic city and was built in the 11th century by the Hammudid dynasty that built the Islamic Caliphate that reigned for 800 years in Europe but was captured during the Reconquista by the Catholic Monarchs Isabella and Ferdinand during the Siege of Malaga in 1487. The complex includes an inner and outer citadel, the remains of a Roman theatre, a military museum, and mosaic enclosed patios and gardens. 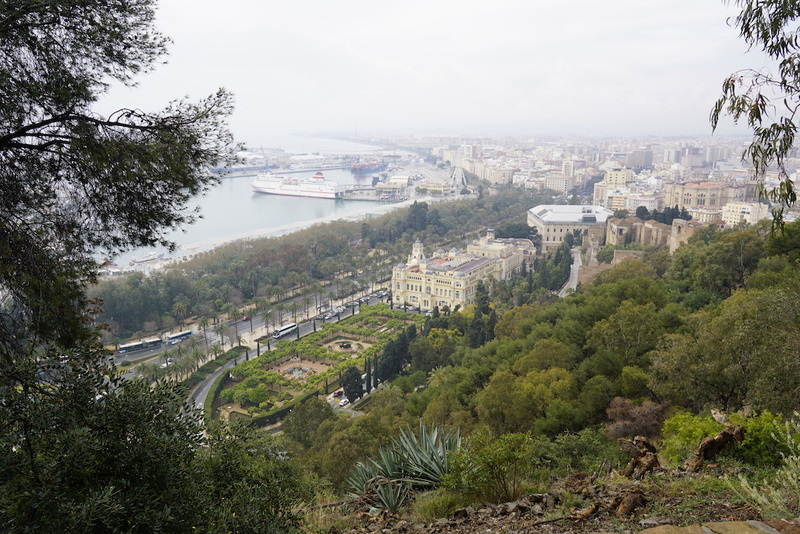 The fortification offers commanding views of prominent landmarks such as the La Malagueta Bullring, the Renaissance Malaga Cathedral, and the harbor below filled with ships from throughout the world and in the far distance the coast of North Africa can be seen. The dusk sky had streaks of pinks, grays, and blues graced with the occasional cloud that provided a spectacular backdrop for the Roman bridge crossing the Guadalquivir River leading to the Great Mosque of Cordoba. Adding further to the drama a full moon appeared high in the sky and was mirrored on the watery surface making for an picture perfect setting. It’s no wonder this famous bridge has appeared in numerous films including the latest Game of Thrones series. The clanging of church bells summoned the Catholic faithful to Sunday mass in the neighborhood square as we entered the quirky cafe that became our home away from home breakfasting in the morning and nightcapping in the evening. As one enters the cafe the aroma of brewing coffee mingled with the sweet scent of fresh tomato puree on toasted bread topped with salty Iberian ham or “toasta” is super enticing. The people in town were friendly and we began a conservation with an interesting local couple. The young woman asked me a question that struck me as particularly insightful. She asked how I felt about visiting Spain given my Native American heritage and the history of Spanish colonialism in America. I was impressed with her perception and knowledge and we spent an enjoyable time connecting with this fascinating pair. The food of Spain is as always SO GOOD! During our stay we had so many memorable meals of Iberian pork, seafood, fresh produce topped with local olive oil. The Andalusian plains are filled with olive trees dedicated to the growing and production of this delicious elixir. There is such abundance that a well known rumor circulates that Italians buys then sells Spanish oil as their own. Who knows? Cordoba is known for its wines (which we drank copious amounts of) as well as its sherry. The local sherry recommended to us from the locals was the PX Dulce Delgado from Montilla-Moriles region. The area is located right at the base of the Sierra Nevada mountains and its rich limestone soil combined with the soaring heat make for the optimum conditions for the Pedro-xinene’nez grape that contributes to the dry and nutty flavor of the golden sherry. Initially for me it was quite strong but one adjust to its robust bite that blends perfectly with tapas. We happily drank our way through numerous bodegas tasting the many sherry varieties of the region. Salud! 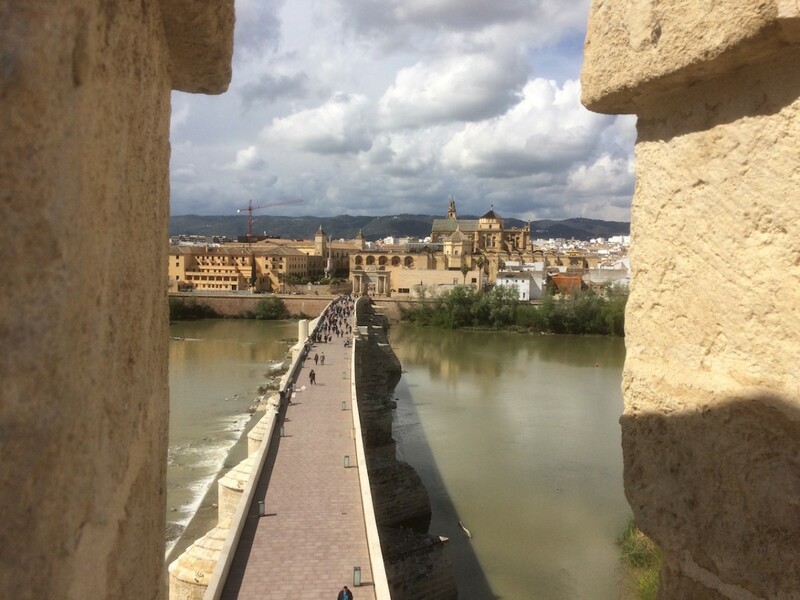 I am a bit biased when it comes to Cordoba. It is one of my favorite cities in Spain with the other being San Sebastian. 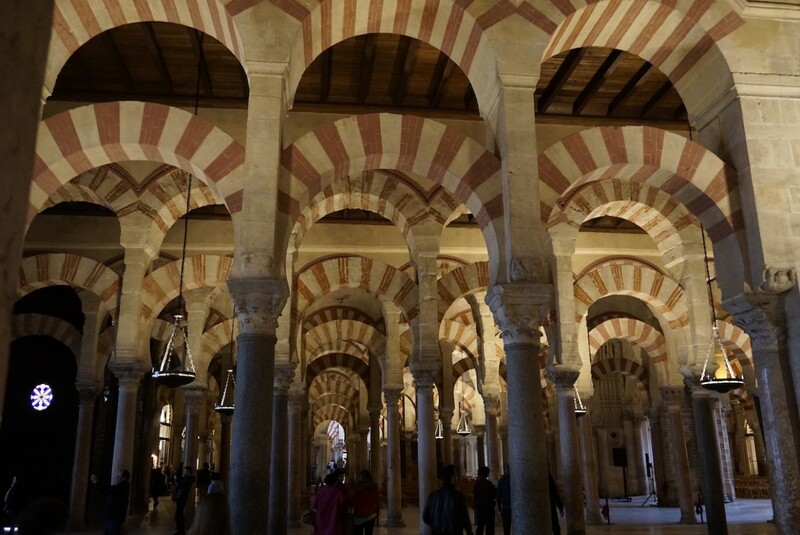 Both have their charms and sights but Cordoba with its Islamic Historic Centre is a recognized UNESCO World Heritage Site and is simply magnificent. The city exudes a noble pedigree that’s expressed in the iconic Mezquita Cathedral that is hailed as the “emblem of the Spanish Caliphate” and its no wonder it’s considered one of the finest representatives of Islamic architecture in Europe. Volumes have been written about this stunning architectural wonder but what struck me was the magnitude of the engineering knowledge brought to Europe in the late eighth century. Thanks to the exiled Prince Adb al Rahman from Damascus who used the Middle Eastern mastery to recreate a Umayyad dynasty in the newly conquered lands of Iberia. The sheer beauty and refined elegance of the Moorish design lent a serenity to the cathedral design and certainly elevated my spirit. In contrast, the Renaissance cathedral built in the center of the mosque reflected many styles from Mudejar to Baroque and stood in stark contrast to the restrained architectural grace of the earlier aesthetic.